So, I planned to share this recipe with you all yesterday. But the tragic events that transpired in Las Vegas made me take pause. Talking about such trivial, frivolous things feels so silly at times like these, and so I held off for a day in an attempt to process all that is going on in this world of ours. Needless to say, I certainly haven’t wrapped my mind around it yet (and probably never will), but I know we all must get up and carry on with our lives, despite the crushing grief we all feel for all of those innocent lives so needlessly lost. With that said, I move onto far less important things. 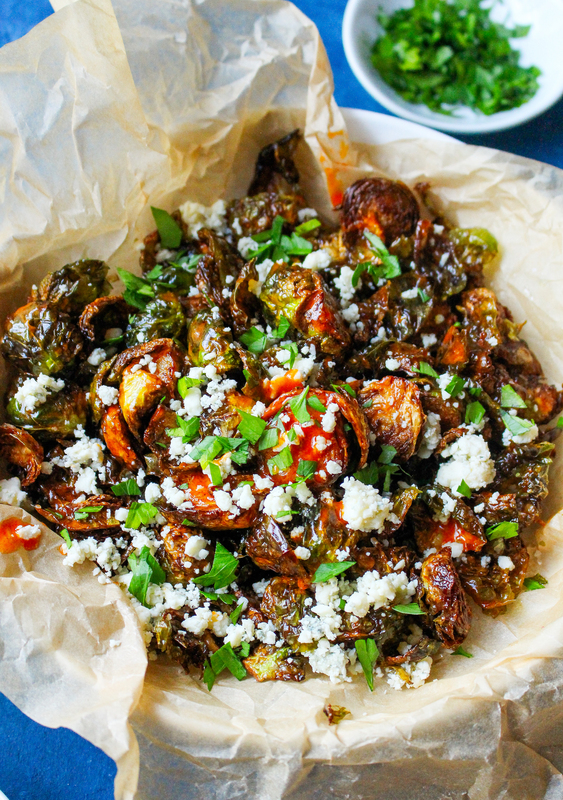 I give you…fried brussels sprouts. Tossed in an addictively spicy and tangy buffalo sauce, loads of fresh herbs, and crumbled cheese. Pretty much the key to eating your emotions, people. 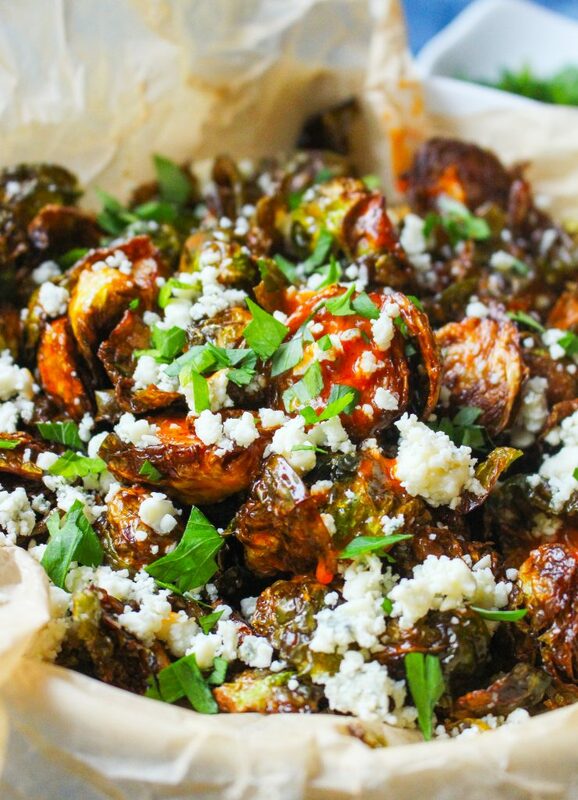 Sure, brussels sprouts aren’t going to solve the world’s problems (not even close), but they do taste damn good. And I don’t know about you, but when I eat damn good food, the weight of the world feels a touch lighter. That’s exactly why certain dishes are referred to as comfort food. And that’s exactly what today’s recipe is all about. These brussels are great for serving to vegetarians who don’t get to enjoy my obsession with buffalo chicken. Seriously. I could buffalo chicken-ize just about anything and never tire of that flavor. I love, love, love it. I’ve been wanting to do a buffalo veggie for some time now. I shared this buffalo corn a few weeks ago, but now that summer corn is fleeting (insert all the crying face emojis here), I decided to attempt it with another veg. Remember when buffalo cauliflower was the big thing? Yeah, well, I tried it and….no thank you. It just didn’t do it for me. I love cauliflower simply roasted. And I love buffalo sauce on just about everything else. Live and let live, right? 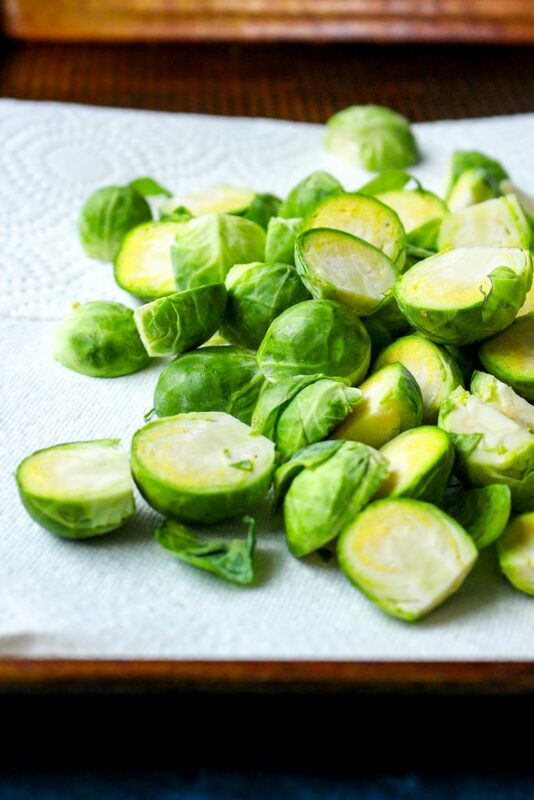 These brussels, though, are SO delicious that I could eat them in lieu of chicken wings or buffalo chicken dip for the rest of my days. And that’s really saying something. 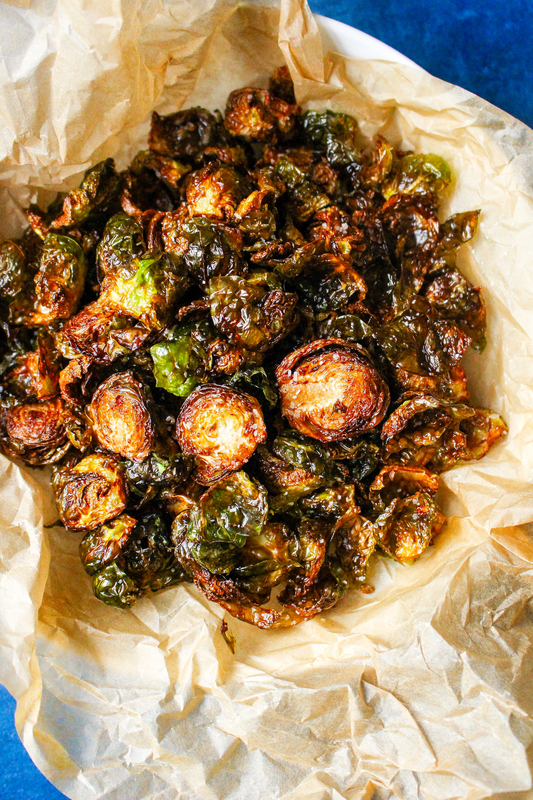 The fact that these brussels are fried might have something to do with that. They get irrisistebly crispy and crunchy and the flavor is insaaaane. Things only get better when buffalo-butter sauce makes an appearance. 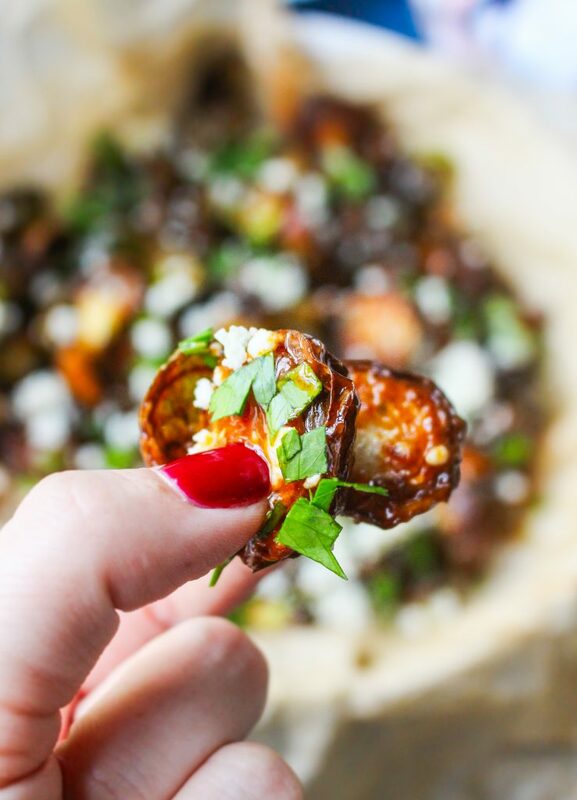 I doused these heavily with the stuff (because it’s my obsession) and then drizzled on some cooling ranch dressing, blue cheese crumbles, and tons of fresh herbs. The result? Completely, ridiculously delicious. Like, in an addicting way. Like, in an “OMG give me the whole platter” way. 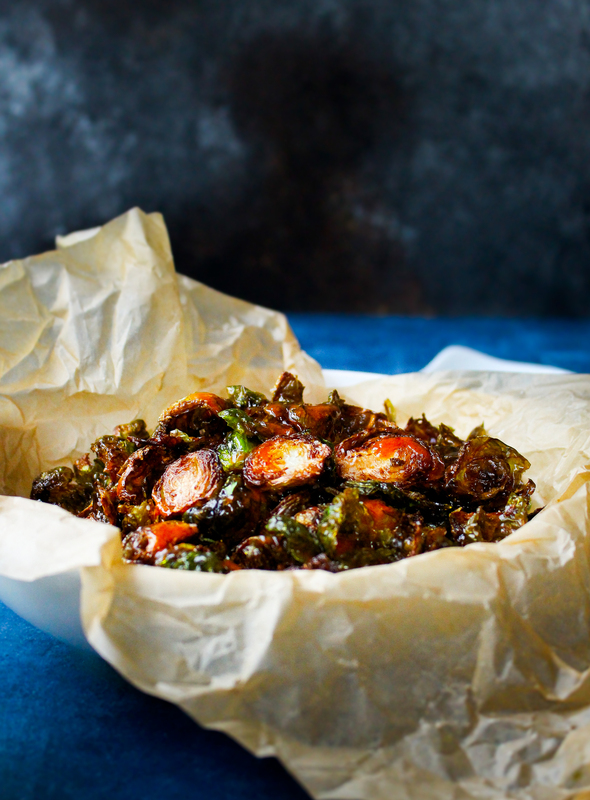 If you want to lighten this recipe up, I suggest roasting the bejeezus out of the brussels instead of frying them. You want to get them REALLY crispy, though, so they hold up to the buffalo sauce. Roast them on a large surface area (two baking sheets would be my preference), at a very high temperature, and with only a touch of oil. I think you’ll get a very similar result that way. These are an amazing addition to any game menu or tailgate experience. I plan on making them time and time again this football season. Fill a large pot with a few inches of oil. Fit with a frying thermometer and heat oil to 400ºF. 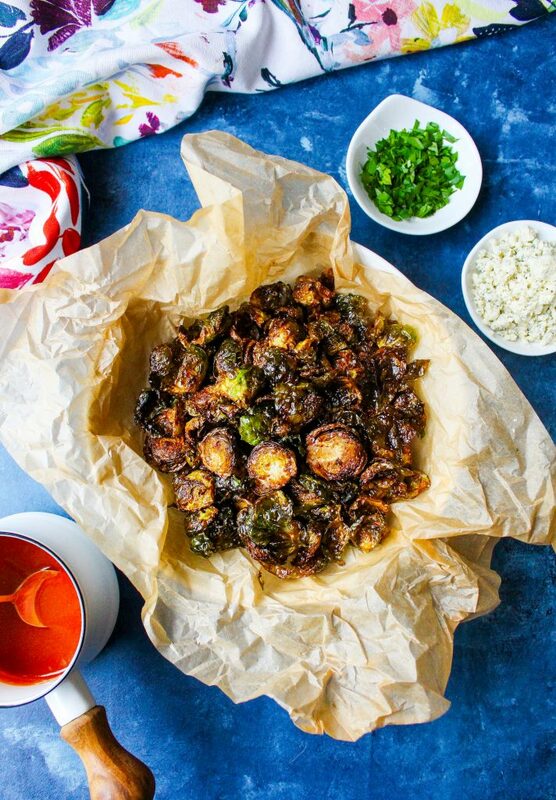 While you are waiting for the oil to heat up, spread your cut brussels sprouts out in an even layer on a baking sheet lined with paper towels. Pat them gently to remove any excess moisture. Before frying them, you want them to be really dry. Not only does this keep the oil splattering to a minimum, but it also ensures that they’ll get crispy. Next, make the sauce by melting the butter in a small saucepan. Once it’s melted, stir in the hot sauce and honey and bring to a simmer. Cook for a few minutes to allow the flavors to meld and then remove from the heat and set aside. When the oil reaches 400ºF, add half the sprouts to the pot. Stir them around and allow them to crisp in the oil for about 3-4 minutes, or until they float to the top and have developed a golden brown color. 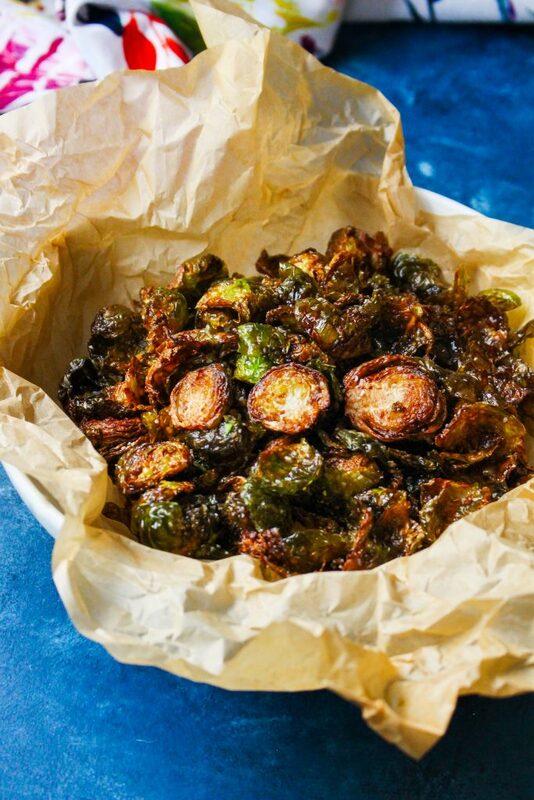 Remove the sprouts from the oil with a slotted spoon and transfer them to a baking sheet lined with paper towels. Season with a pinch of salt. Repeat with the remaining sprouts. Once all the sprouts have been fried, toss them in a large bowl with a couple drizzles of the buffalo sauce while they are still warm. Once they’re evenly coated in the sauce, transfer them to a platter and garnish them with ranch/blue cheese dressing (drizzled over top or serve it on the side), crumbled cheese, and fresh herbs. Serve immediately. But the big question here for me, is do they remain crispy after saucing? The ingredients sound yummy, but really, really want them crisp. Thank you! These are literally everything. 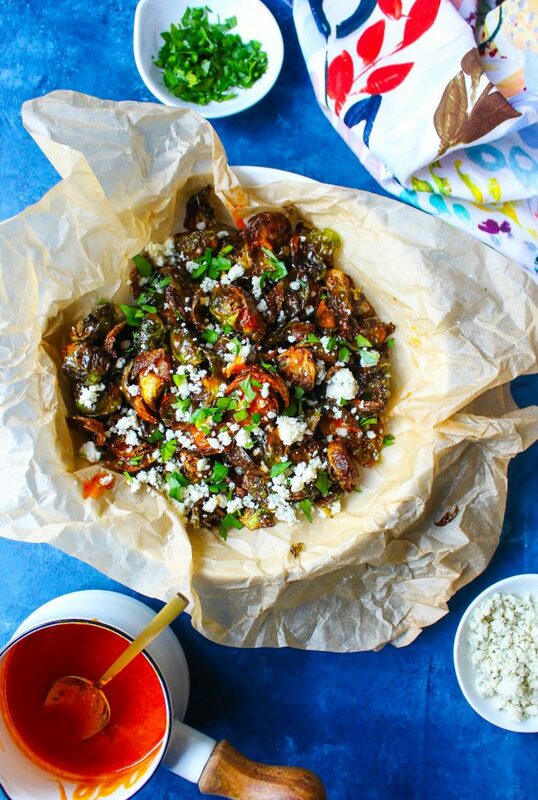 Why buffalo brussels sprouts aren’t already an international sensation I have no idea. Gotta try!